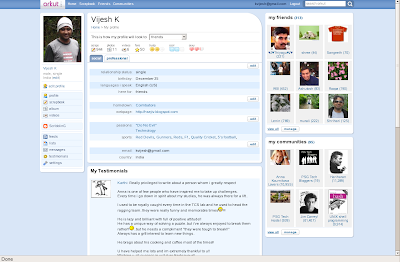 i want to add jus 1 more thing that has to be changed in orkut(new). In the scrap book in which the time of the scrap is aligned left due to the delete button by its side. So it looks unformatted while comparing it with the scraps which don have the delete button. In the older version the delete button was at bottom right corner, which looked nice. hmm...y is 'rounded corners' considered nice? Sharp corners is usual, and boring to our eyes! Hence rounded is a change.